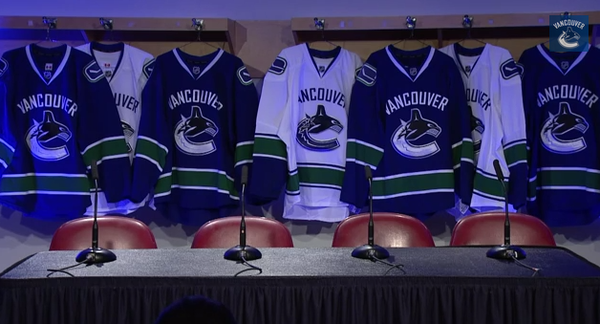 As is an annual tradition, the Vancouver Canucks made most of their players – to go along with the head coach and GM – available to the media this morning, signalling the official start of the new season’s training camp. Whether it was coming from one of the veteran players or one of the many newcomers being thrust into the spotlight, there were a couple of talking points that seemed pervasive throughout. They were of a singularly positive nature, though as Chris Higgins astutely reminded us, “everything looks good in the summer.” He would know what does and doesn’t look good. Video and a few choice quotes past the jump. It’s impossible to know just how Willie Desjardins will translate as an NHL coach because of the lack of a track record at the level, but what is abundantly clear by now is that he should be in the players’ good books. He reportedly went on an introductory tour this summer, visiting the team’s veteran players in Sweden, Montreal, Toronto, and even Smithers. Speaking of Vrbata, his new linemates were very complimentary when asked about him. Beyond that, both the players and the coach harped on their shared desire to get back to an up-tempo style of attacking game which has made them successful in years past. That, and the depth they’ve tried to cultivate throughout the summer so as to afford themselves the opportunity of rolling 4 lines without a noticeable drop-off. Overall, while it was a nice reminder that hockey season is just around the corner, there wasn’t all that much to gleen from the event. In fact, without any real controversy to speak of, it even drier than it has been in year’s past. Look no further than last year’s recap, in which the highlights were Roberto Luongo answering questions about his coach disapproving of his Twitter account, the Sedins needing new contracts, and the such. Ultimately the tune could start to resemble something completely different in a hurry as we learned in ’13-’14 – “we’re going to prove the doubters wrong and make them eat their words” is an unfabricated quote from Ryan Kesler at this time last year re: his relationship with Tortorella – but for now the general sentiment was a glowing one. Case in point the picture of Smiling Dan Hamhuis which we’ll end this post with (and which you should most definitely save, because who really knows if we’ll ever be afforded the luxury of seeing it again!). Now that media day is over and done with, the team heads to Whistler for the next 4 days with 61 players in tow. Shortly thereafter, the preseason will get underway with a split-squad contest against the Sharks taking place just 5 days from now. If Dan Hamhuis’ smile doesn’t pump you up, then maybe that will. WHO’S READY FOR SOME HOCKEY!!!! I’d rather go fishing for partly contaminated fish over at Stanley Park. Wow, Training camp story and two comments from Canucks fans. Move the team to Seattle and get some real fans cheering for the this franchise.